The application is open until June 25, 2018. Understanding the structure of quantum field theories and their observational consequences beyond the realm of perturbation theory constitutes one of the central challenges in theoretical physics. Progress along this research frontier may be the key for answering fundamental questions related to the structure of space, time, and matter. Following the idea of “renormalizing the non-renormalizable”, this route may even allow for a unified description of all fundamental forces, including gravity, within the framework of renormalizable quantum field theories. A central tool for exploring this essentially uncharted territory are functional methods based, e.g., on path integrals or functional renormalization group equations. The proposed topical workshop will survey recent developments and future opportunities in this field. 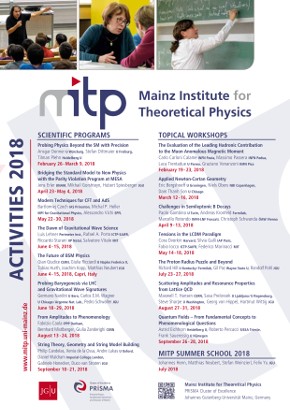 The scientific focus will cover fundamental aspects and a discussion of possible quantum gravity signatures observable in particle physics, black holes, and cosmology. The goal is to develop new roadmaps for obtaining a description of our world valid on all scales and identify new connections between the fundamental descriptions and phenomenological consequences within the various approaches. A central figure in developing this research area is Martin Reuter (Johannes-Gutenberg University Mainz) whose works have been essential in shaping this research field. In particular his formulation of a non-perturbative renormalization group equation for gravity marked the onset of the asymptotic safety program in its modern form. His deep insights related to the quantum properties of spacetime and matter quickly made him a figurehead of this flourishing research program. The planned workshop constitutes an excellent opportunity for bringing together the top researchers and young talents working in this field to celebrate the 60th birthday of this internationally renowned and visionary scientist.